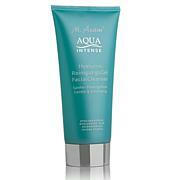 A full-size hydrating, cleansing serum, suitable for all skin types with included travel size. Every morning and night, gently massage a quarter-size amount of Confidence in a Cleanser onto your skin for 30 seconds, then rinse and pat dry. 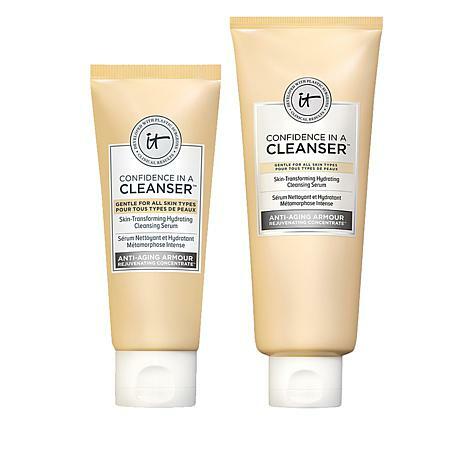 Ingredients: Confidence In A Cleanser Ingredients: Aqua/water/eau, Disodium Cocoamphodiacetate, Glycerin, Acrylates Copolymer, Sodium Chloride, 1,2-hexanediol, Peg-7 Glyceryl Cocoate, Arginine Cocoate, Cocamidopropyl Betaine, Peg-120 Methyl Glucose Dioleate, Styrene/acrylates Copolymer, Potassium Cocoyl Glycinate, Coco-glucoside, Citric Acid, Hexylene Glycol, Portulaca Oleracea Extract, Limnanthes Alba (Meadowfoam) Seed Oil, Allantoin, Xanthan Gum, Cymbopogon Martini Oil, Pelargonium Graveolens Flower Oil, Citrus Paradisi (Grapefruit) Peel Oil, Lavandula Angustifolia (Lavender) Oil, Citrus Sinensis Peel Oil Expressed, Butylene Glycol, Hydrolyzed Collagen, Ethylhexylglycerin, Niacinamide, Camellia Sinensis Leaf Extract, Tocopheryl Acetate, Ascorbyl Tetraisopalmitate, Glycyrrhiza Glabra (Licorice) Root Extract, Chamomilla Recutita (Matricaria) Flower Water, Colloidal Oatmeal, Leuconostoc/radish Root Ferment Filtrate, Aloe Barbadensis Leaf Extract, Curcuma Longa (Turmeric) Root Extract, Melaleuca Alternifolia (Tea Tree) Leaf Oil, Glyceryl Stearate, Palmitic Acid, Stearic Acid, Phytosteryl/isostearyl/cetyl/stearyl/behenyl Dimer Dilinoleate, Hydrogenated Polydecene, Ceramide Np, Butyrospermum Parkii (Shea) Butter, Ceteareth-20, Glyceryl Citrate/lactate/linoleate/oleate, Hydroxypropyl Bispalmitamide Mea, Glycosphingolipids, Glycine Soja (Soybean) Sterols, Meadowfoam Estolide, Ceramide Ap, Ethylhexyl Isonanoate, Squalane, Sodium Hyaluronate, Polysorbate 20, Carbomer, Palmitoyl Pentapeptide-4, Steareth-20, Chrysin, Palmitoyl Tripeptide-1, Palmitoyl Tetrapeptide-7, N-hydroxysuccinimide, Disodium Edta, Benzoic Acid, Phenoxyethanol, Potassium Sorbate, Chlorhexidine Digluconate, Fd&c Yellow No. 5 (Ci 19140). This needs be on auto delivery and super size !! Please ! I am an IT girl so I had to try this product. 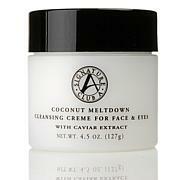 I am hooked, loved lathering it up on my face and removing all my makeup and buildup of the day. Left my skin glowing, clean and feeling fresh. Love using it with my clarisonic every morning in the shower. I didnt expect this cleanser serum to be a game changer, but it is. Not only does it to cleanse my skin but its also hard to write a few rough patches. I am totally amazed. 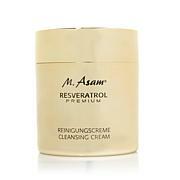 It has worked on some of these rough patches of skin where my other skin care has not. 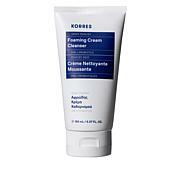 Plus, the smell of this cleanser is heavenly. Smells very lemony.